For the lady with the Jack Russell cross... Schnauzer ? Not really a story, but to the lady wanted to know if her 8 week old puppy was a mini-schnauzer.. 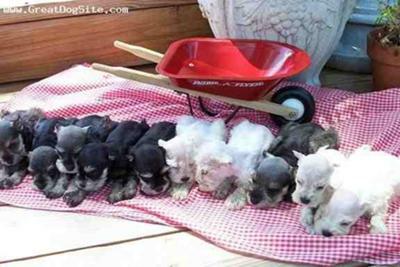 I very much doubt it.. as I am posting a photo of what 8 week old mini-schnauzer puppies should look like. It is possible that her puppy's mother was mated by another dog, by mistake, whilst she was in season.. hence the Jack Russell x type... but if she doesn't mind I'm sure that her puppy will give her many years of happiness and love.... whether Schnauzer or not..